Whether we like it or not, there are authorization providers who are hurting our industry and its patients. With so many providers to choose from, it can be difficult to determine who is truly looking after the patients’ best interests. We have compiled a list of what we consider THREE tell-tale signs that a provider is not offering any value to its patients. 1. A practice or business that exists solely for medical cannabis authorizations. Not only is this illegal, it’s a trait of a “fly by night” doctor or business looking to capitalize on the seemingly booming demand for medical cannabis in Washington State. If you saw a healthcare professional that had no private medical practice and worked exclusively at an “authorization clinic”, chances are they won’t be around much longer. As a patient making an important decision about your healthcare, it is important to do your research, particularly of businesses new to the industry to make sure they are practicing legal compliance and not here to make a quick buck. Having been in the industry for a few years now, we have seen many providers come and go. 2. Inconsistent or non-existent patient verification. It has been said that not all authorizations are created equal. Among other things, it is absolutely true that patients value consistent verification. Was patient verification and quality healthcare a top priority for your provider, or was pricing (a better way to look at this is: did you make your decision based on their price or what they offer their patients)? We hope you went with the latter. As a patient in the medical cannabis industry, it is much more important to secure your well-being and health, rather than your wallet. Basic verification is mandatory, but consistent verification is what you should desire. How reliable is your provider’s verification and is the database they store your information on secure and compliant with HIPAA? That leads to the next point. 3. No data security or HIPAA compliance with patient data or verification. Here is one thing many providers don’t know: Patient data that is electronically transmitted is subject to HIPAA compliance. Seeing as how many providers now offer online verification, it is critical that patients ensure verification websites they belong to are HIPAA compliant. 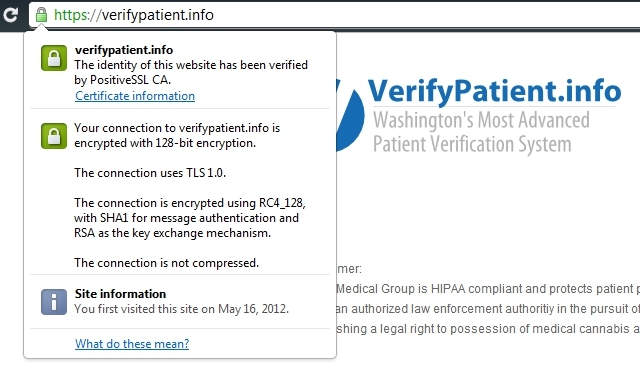 A very basic requirement for any website transacting patient data, is encryption. Encryption is the security feature of rendering information unreadable except to privileged personnel with a “key”. Look for a lock-pad in the address bar of the website you belong to. The data server itself, which hosts the database and website, must be HIPAA Certified – and this is not as easy as placing an image at the footer of the website claiming HIPAA compliance. For starters, a large requirement is that the data must be replicated (backed up) for recovery reasons. Another requirement is that the data must be able to be permanently disposed of when no longer needed. There are other requirements, but to start, asking your provider and seeing how they reply, is a great first step. Being at the forefront of the Medical Cannabis Industry for innovation, our top priority at Green Medical Group has been to drive significant value to our patients. We believe this is the only way to strengthen the industry’s credibility and reputation in the long-term. The better we make the industry look as a whole, the more accepted it will become. While medical marijuana will always have its stigmas, we believe its acceptance is just an attitude away.